Americans warned that conservation is a communist plot! It’s usually safe to ignore anything US detectorists say about UK detecting as their lack of knowledge is obvious. However, I’d like to correct a blatant piece of misinformation just offered to them by an English detectorist as I suspect it refers partly to us. He talks of “the dictum of archaeology’s ‘Hard Left’ faction” (that’ll be us no doubt, we’re often portrayed as commies or Nazis) “who promote the notion that all land, artefacts, and collectibles should belong to the People”. Now if you’re in Britain you’ll know that’s nonsense as neither we nor anyone else advocate nationalisation of land or artefacts or collectables, but for the avoidance of doubt: we don’t advocate nationalisation of all historic artefacts! We don’t even advocate the nationalisation of historical knowledge – for the simple reason it already belongs to the public! All we want is for detecting to be regulated so that thousands of people stop stealing the public’s knowledge by not reporting their finds. How Hard Left is that! The two types of heritage theft, one criminal and relatively small-scale, one legal and massive ……. Communist propaganda or the plain truth? Thank you for continuing to bang on about this issue — fascist attitudes always need to be guarded against and expised whenever they raise their heads. Well, today they’ll unearth another 800 recordable artefacts with many thousands of bits of knowledge about history attached – and mostly won’t report them. Tomorrow the same. Massive historicide stretching over nearly 40 years. Someone has to bang on and on and on about that and the self-congratulatory blather of the culprits! Idiotic statement that fortunately many Americans will not believe. 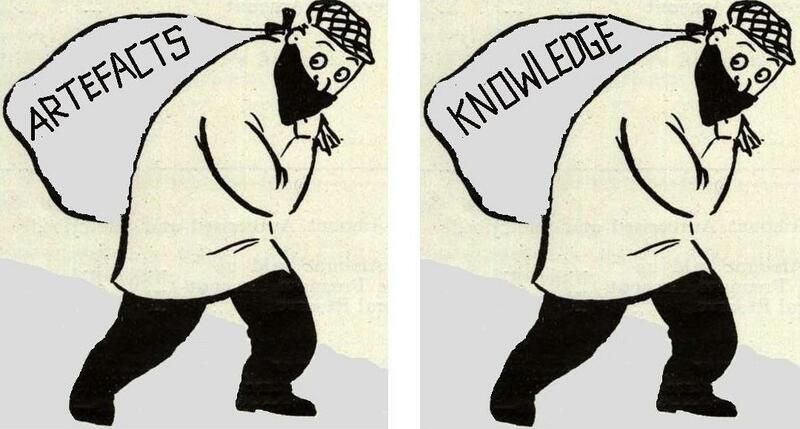 I am 100% in agreement on theft of and ownership of knowledge but ambivalent towards any idea that all finds belong to the public. Certainly all should be declared though and declared to the landowner as well as PAS. Call it it cupidity or stupidity but if I found something beautiful in my bit of wood I would certainly make its existence freely known and allow any examination of itself and its surroundings but would I not though be the heir of whoever hid or lost it? Some people declare that all finds belong to the public, something you will have seen for yourselves. An object which falls within the statutory definition of treasure belongs to the Crown. The Treasure Act 1996 applies to items of gold or silver with a 10% content of precious metal provided that they are at least 300 years old. So although it says Crown the assumption is that is normally on behalf of the public. Various forums dealing with historic artifacts have people saying this such as The Bronze Age Center but of course other people disagree. Only a miniscule percentage of finds fall under the Treasure Act so I’m still doubtful that “some people declare that all finds belong to the public”. It’s not a question of suiting myself, you reckoned some people believe all finds belong to the public but can’t substantiate it. Simple. Artefacts belong to the landowner. All you have done is quote someone saying archeologists and academics say “art” belongs to everyone – which it clearly does, not specific objects. This is a metaldetectoristic level of failure to comprehend. As your point of view on any matter is obviously the one and only and “discussion” is a farce with you shall now cease to participate. I think the real reason is you’ve been outed! « Caerau: Come and join the excavations!